Philip Smith currently serves as William F. and Pamela P. Prokasy Professor in the Arts at the Hugh Hodgson School of Music at the University of Georgia after his recent retirement from the New York Philharmonic, where he held the position of Principal Trumpet since 1988. Mr. Smith’s father, Derek Smith, a renowned English cornet soloist, provided his early training. He is a graduate of The Juilliard School, having studied with Edward Treutel and William Vacchiano, former Principal Trumpet of the New York Philharmonic. In January 1975, while still at Juilliard, Sir Georg Solti appointed Mr. Smith to the Chicago Symphony Orchestra. Mr. Smith has appeared regularly as soloist, recitalist, chamber orchestra performer, and clinician. He has been featured as a soloist with the Philharmonic performing with conductors Zubin Mehta, Kurt Masur, Erich Leinsdorf, Leonard Bernstein, Neeme Järvi, Lorin Maazel, Alan Gilbert and Bramwell Tovey. Repertoire highlights have included the world premiere of Joseph Turrin’s Trumpet Concerto with the New York Philharmonic (1989) and its subsequent European premiere with the Leipzig Gewandhaus Orchestra (1994). Additional New York Philharmonic performances have included the U.S. premiere of Jacques Hetu’s Trumpet Concerto (1992), the world premiere of Lowell Liebermann’s Concerto (2000), and the world premiere of Siegfried Matthus’s Double Concerto for Trumpet, Trombone, and Orchestra (2003). He has also been a guest soloist with the Mostly Mozart Festival Orchestra, and the symphonies of Edmonton, Newfoundland, South Dakota, Sioux City, Cedar Rapids (Orchestra Iowa), Columbus (Indiana), Pensacola (Florida), Hartford (Connecticut), and Beaumont (Texas). He has appeared as guest Principal Trumpet with the Orchestre de Paris, conducted by Daniel Barenboim, performing Mahler’s Symphony #5. Mr. Smith has also appeared with many symphonic wind ensembles, including the US “President’s Own” Marine Band, the West Point Academy Band, the US Army TRADOC Band, the US Coast Guard Band, La Philharmonie des Vents des Quebec and many major university wind ensembles. He appeared at The College Band Directors National Association Convention in Austin, Texas, for the world premiere of Turrin’s Chronicles (1999) with the University of New Mexico Wind Ensemble. A subsequent recording ofChronicles was produced which included the world premiere of Stephen Gryc’s Evensong (2000) and Turrin’s Fandango (2000). Alfred Cohen’s …curls of motion… was premiered in 2008 with the Columbus State University Wind Ensemble. Aaron Kernis’ a Voice, a Messenger was premiered in 2013 with the University of Illinois Wind Ensemble. An avid brass band enthusiast, Mr. Smith has been guest soloist with the United States Army Brass Band, and the contesting bands of Goteborg Brass (Sweden), Black Dyke Mills and Rigid Containers Band (Britain), Hannaford Street Silver Band and Intrada Brass (Canada), as well as Columbus Brass Band, Triangle Brass Band, and Imperial Brass (USA). He has soloed with all of the Salvation Army Staff Bands worldwide including the International Staff Band, New York, Chicago, Amsterdam, Melbourne, German and Japan. He appeared as featured soloist at the 1996 British Open Brass Band Championships in Manchester, England. In addition to soloing, Mr. Smith has conducted many brass bands and brass ensembles, most recently the Imperial Brass and Gramercy Brass in the summer of 2015, and the Georgia Brass Band in the Fall of 2014. He hosted and conducted the New York Philharmonic Brass and Percussion at the 2014 “Holiday Brass” in Avery Fisher Hall. He also conducted this group at the Dedication Ceremony of the September 11 Museum in New York City on May 15, 2014. Mr. Smith has been on the faculty of The Juilliard School and Manhattan School of Music, and has appeared as recitalist and clinician at the Caramoor International Music Festival, Grand Teton Music Festival, Swiss Brass Week, Breman (Germany) Trumpet Days, Oslo (Norway) Trumpet Week, Harmony Ridge (Vermont) Festival, Scotia Festival of Music and numerous International Trumpet Guild conferences. During the summer of 2015, he taught, and performed at the Le Domaine Forget International Music Academy in Quebec, Canada, the Blekinge International Brass Academy (BIBA) in Karlskrona, Sweden, and the MasterWorks Festival in Winona Lake, Indiana. In 2005, Mr. Smith was made an Honorary Member of the Royal Academy of Music (Hon RAM). In 2006, Mr. Smith was given the International Trumpet Guild Honorary Award. As a member of the Principal Brass Quintet, Mr. Smith has toured Japan four times, as well as Brazil and Germany. He has also performed and recorded with the Canadian Brass, Empire Brass, Chamber Music Society of Lincoln Center, Bargemusic, and New York Virtuosi Chamber Symphony. His solo recordings include Contest Solos produced by the International Trumpet Guild; Fandango, featuring New York Philharmonic Principal Trombonist Joseph Alessi and the University of New Mexico Wind Symphony (Summit); My Song of Songs with the New York Staff Band of The Salvation Army (Triumphonic); Copland’s Quiet City (Deutsche Grammophone); New York Legends (CALA); Orchestral Excerpts for Trumpet (Summit); Ellen Taaffe Zwilich’s Concerto for Trumpet and Five Instruments (New World); Bach’sBrandenburg Concerto No. 2 (Koch); Walton’s Façade (Arabesque); and The Trump Shall Resound and Repeat the Sounding Joy (Heritage). Mr. Smith has collaborated on a series of projects with Curnow Music Press (Hal Leonard), publishing music arrangements with demonstration CDs. These include Great Hymns, More Great Hymns, and Great Christmas Carols for Trumpet and Piano. Two trumpet study books with demo CD have also been produced, Concert Studies andAdvanced Concert Studies. In a similar project published by Michael Davis and Hip-Bone Music, Mr. Smith has recorded the 20 minute WARM UP ROUTINE and the new 10 MWU etude book. Also in this series is Total Trumpet, featuring a variety of trumpet studies demonstrated by Randy Brecker, Jim Hynes and Philip Smith. Mr. Smith’s film soundtrack credits include: Cobb (1994) music by Elliot Goldenthal; The Hudsucker Proxy (1994) music by Carter Burwell; A Time To Kill (1996) music by Elliot Goldenthal; Punchline (1998) music by Gary Anderson and Charles Gross; Sphere (1998) music by Elliot Goldenthal; The Rookie (2002) music by Carter Burwell; The Ladykillers (2004) music by Carter Burwell; Manchurian Candidate (2004) music by Rachel Portman; Hitch (2005) music by George Fenton and Alan Elliot. His commercial soundtrack credits include: "NBC Sunday Night Football Theme 2006" music by John Williams; "NBC Super Bowl XVIII Theme 2008" music by John Williams and Joel Beckerman (currently heard); "NBC and Golf Channel Tournament Theme 2013" music by Joel Beckerman. Gabriele Cassone received his conservatory diploma in Trumpet following studies with Mario Catena, and in Composition studying with Luciano Chailly. He is world renowned not only as a historical artist performing on original instruments (Baroque natural trumpet, Classical keyed trumpet, rotary valve trumpet and piston cornet), but enjoys an equal fame as a contemporary musician. Luciano Berio selected Gabriele Cassone to premiere his works for solo trumpet: Sequenza X for solo trumpet, and Kol-Od, performed with L'Ensemble Intercontemporain under the direction of Pierre Boulez. He has also shared the stage with celebrated trombonist Christian Lindberg in performances of Berio's opera Cronaca del Luogo, commissioned by the Salzburg Festival. Famous international conductors have requested Gabriele Cassone for performances of the most demanding trumpet repertoire; Sir John Eliot Gardiner named him principal trumpet in the English Baroque Soloists for the entire cycle of J.S. Bach's Cantatas, and for the Second Brandenburg Concerto, and Ton Koopman, director of the Amsterdam Baroque Orchestra, requested him as principal trumpet for the ensemble's recording of Cantata BWV 51 by J.S. Bach. He has a duo with Antonio Frigé, with whom he was co-founder of the baroque music Ensemble Pian&Forte. Gabriele Cassone has given solo concerts in major international theatres including the Concertgebouw in Amsterdam, Cité de la Musique in Paris, La Scala in Milano, the Mozarteum in Salzburg, New York's Carnegie Hall, the Queen Elizabeth Hall in London and the Vienna Konzerthaus. He is featured on over twenty acclaimed compact disc recordings in repertoire spanning the centuries from the baroque through the contemporary era. 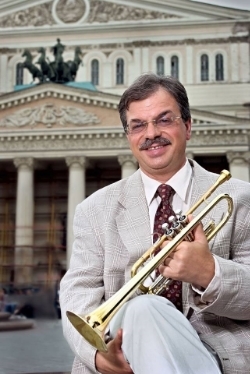 Andrei Ikov, Principal Trumpet with the Bolshoi Theater Orchestra and teacher at the Moscow Conservatory, was born in Moscow in 1960. He studied music in Prokofiev`s and Gnesins` musical schools. His teachers were A. Bazarov, V. Krichevsky and V. Shlepakov. Then he studied at the Moscow Conservatory and his teachers were Prof. G. Orvid, Y. Krivosheyev and L. Volodin. In 1980 he took the 3rd prize at the All Union Contest of Wind Performers, in 1982 he won the first prize at the International Contest "Prague Spring." At that time he worked in the Stale Symphony Orchestra of the USSR (conducted by Y. Svetlanov), and in 1990 he became a trumpeter in the Russian National Symphony Orchestra (conducted by M. Pletnev). At his solo concerts he played with many famous musicians such as L. Roisman, O. Jantchenko, M. Kasrashvili, I. Zhurina, R. Abdullin, ensemble of soloists "The Russian Consort." He was one of the first performers of the 2nd Brandenburg Concerto by J. S. Bach in Russia. He has toured around Europe including the countries of Greece, Germany, and Sweden. Raquel Rodriquez is the Assistant Professor of Trumpet at Tennessee Tech University. Raquel is a versatile musician having appeared as a clinician, soloist, and chamber musician throughout the United States and abroad. Raquel is principal trumpet of the Bryan Symphony Orchestra, a professional orchestra in residence at Tennessee Tech University (TTU). Active as a chamber musician, Raquel is 1st trumpet with the Brass Arts Quintet (TTU Faculty Brass) and an associate member with Seraph Brass, a brass quintet comprised of top female brass players in North America. Active with the International Trumpet Guild (ITG) organization, Raquel is the Editor of the Trumpet Technology Column in the ITG Journal and Co-Editor of the ITG Video Page. Raquel has additionally served as a reporter for the ITG Journal and Video page at the ITG Conferences. Raquel has served as an adjudicator at the National Trumpet Competition, International Trumpet Guild Conference, and various state and local solo competitions. Dr. Rodriquez holds the DMA in Trumpet Performance from The University of North Texas and a MA and Bachelor’s degree in Music Education from West Texas A&M University. Dr. Bradley Ulrich, professor of music, has been the trumpet professor at Western Carolina University since 1989. He received his Bachelor of Music Degree in Trumpet Performance from the Florida State University where he studied with Bryan Goff. His Master of Music and Doctor of Musical Arts degrees in Trumpet Performance and Literature were awarded from the University of Illinois, Champaign-Urbana, where he studied with Ray Sasaki and Michael Tunnell. He has had additional lessons with Raymond Mase, George Vosburgh, Adolphe Herseth, James Thompson, Vincent DiMartino, and Chrispian Steele Perkins. Maintaining an active performing career, Dr. Ulrich currently performs with the Asheville Symphony Orchestra. He has formerly held positions in the Hendersonville Symphony Orchestra, Greenville Symphony Orchestra (SC), Brevard Chamber Orchestra the Springfield Symphony Orchestra (IL), the Champaign-Urbana Symphony (IL), Sinfonia da Camera (IL), and the Cedar Falls Waterloo Symphony (IA). In addition to his orchestral experience, Dr. Ulrich has performed countless recitals both as a soloist and in brass quintets. He has performed and taught across the United States and in Russia, Canada, England, Ireland, Wales, St. Barths, Italy, China, Germany, Jamaica, Hungary, Romania, and the Czech Republic. Dr. Ulrich is the Artistic Director/First Trumpet of the Smoky Mountain Brass Quintet, Quintet in Residence at WCU, which gave its New York debut at the Weill Recital Hall at Carnegie Hall in June 2007. Dr. Ulrich has published over a dozen articles in the International Trumpet Guild's Journal and was for 10 years Public Relations Director for ITG and the Competition Page Editor for the ITG Youth Website. He has also served on the Membership Development Committee for ITG. Dr. Ulrich is the Executive Director of the Trumpet Festival of the Southeast and Artistic Director for the International Trumpet Festival of Russia. He is an Artist/Clinician and member of the Product Advisory Council for the Jupiter Band Instrument Company. Dr. Ulrich has three won the James Dooley Award for Excellence in Teaching Music (2002, 2008, 2015) and in 2013 he was awarded the prestigious University Scholar Award from Western Carolina University.